Yet another new feature buried within iOS 6. The iOS 6 beta has been available for four days now, but we’re still stumbling across new features that Apple didn’t mention during WWDC. One of those is the ability to receive government AMBER and emergency alerts automatically on your iPhone, iPad, or iPod touch. 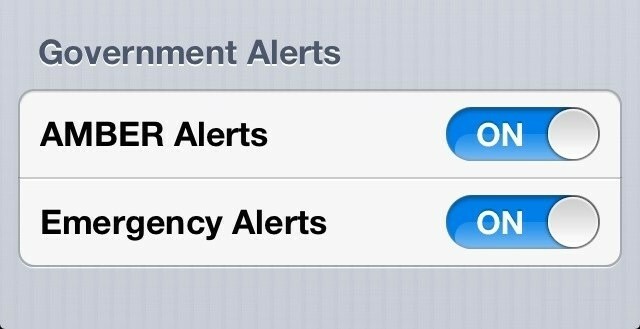 Buried within the Notifications settings for those in the United States is the ability to toggle “Government Alerts” for AMBER and emergency notifications. If you’re unfamiliar with AMBER — and you may be if you don’t live in the U.S. — it stands for America’s Missing: Broadcasting Emergency Response. It’s a child abduction bulletin that details missing children, along with their description and a description of their abductor. It’s already possible to receive AMBER alerts on your iPhone via SMS, but now they’re integrated into iOS 6. User can also receive emergency alerts. This will provide you with a notification for things like tornados, earthquakes, terrorist alerts, and nuclear attacks. Right now, it appears these features are not available outside of the U.S., but there may be similar offerings in other countries in the future.